Treasure the memory forever, with this beautifully handcrafted bracelet. There are so many ways to tell her "I love you." 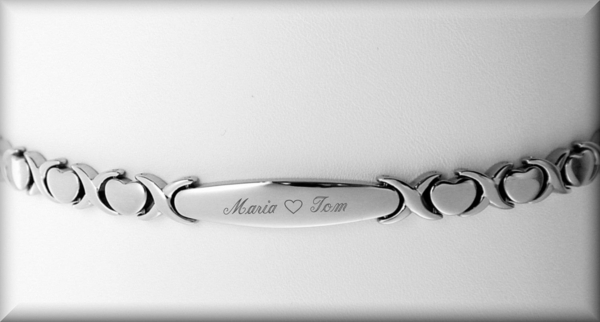 something personalized and unforgettable, this stainless steel smooth bracelet is the perfect expression. For the passionate kisses and sweet hugs you share, this xoxo bracelet romantic perfect gift to say I Love You. A keepsake she'll treasure forever, the bracelet is 7.25 to 9 inches in length adjustable with a claw clasp. Great quality.